Derived products, CD albums & anime / Producer Meeting 2017 - Fun to the new vision!! Who is going or is planning to go to the producer meeting on the 28th and 29th of January 2017? Personally i would really like to go, especially since it now looks like it will be a proper live (at least that's my impression after looking at the merchandise you can currently preorder), not to mention that it will be the first time in several years where all the seiyuu will be present. Unfortunately i didn't land a hit at the ticket lottery from Platinum Stars, so now i'm hoping i'll have more luck with the lottery from the Platinum Master 2 (bokutachi no resistance) and 3 (amaterasu) CDs. If anyone has spare tickets or lottery codes they don't need that would help too ofc. I'm applying for 2 tickets with each lottery entry, i'm sure i'll find someone who will want a ticket should i win. might mean that the DL lives are only time limited to download, but once you got them you can play them as long as you want. Edit: The more i look at it the more i think that there is no time limit whatsoever to the DL lives, even for the download. Well, apart from when they start. The 2 week time limit is just for the P drops. See all affection events with an idol. This requires 5 hearts with the idol. These events appear in the evening, typically on the same day as you got a new heart with her. I have completely overhauled the text from this post, added new information and sections and posted it as FAQ on GameFAQs. I'll try to keep the GameFAQs version up to date when things change (such as new skills becoming available or old skills on new slots). I want to write down all the stuff i have found so far about scoring. I have written it down for myself so far, but posting it here will allow more people to benefit from it, and others can help me fill out the gaps i still have. So if you have anything to add, please do so. This should also give us a base for discussions. The score of normal appeals is more or less constant for all songs, there are some differences though. This means: the more notes a song has, the lower the score per appeal. I do not know if this factors in the double score from double notes (where you have to press 2 buttons) and the double score from the burst. It also means that the song or difficulty doesn't matter (much) for this part of the score. 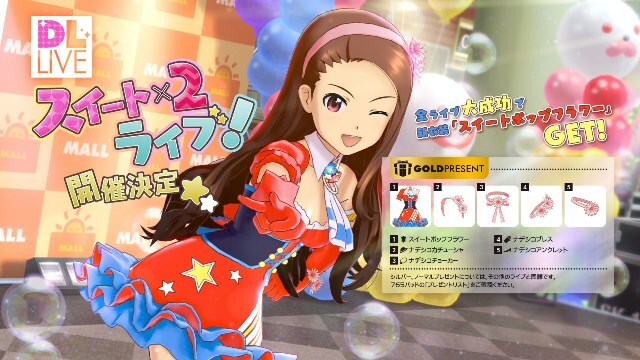 If the event has a special type (idol, shiny star, kirakira girl, heartful lady and genki musume), wearing a costume with that type doubles the points gained from normal appeals. The special types on some of the DL live costumes also count as the corresponding "normal" type. For example charming lady also counts as heartful lady, but not the other way around, or trickster counts as shiny star. Once per song there is an opportunity for an extreme burst. The score for the burst itself works off the unit's burst score. While the burst animation is running, all appeals give double score. After the animation has ended, this bonus stays intact, as long as you get perfects or goods. To perform a certain type of burst you need a costume with the corresponding skill. For quintet bursts and solo burst you need charge lvl 1 AND charge lvl 2 AND charge lvl 3 (typically legs). At the beginning of the game you get a head piece which has all 3 charge levels in one item. To perform trio omoide appeals you need an accessory with the drive duo AND another one with the drive trio skill (usually legs). For omoide quintet appeals you also need the drive quintet skill on top of it, it's quite rare and on costumes. For events which also require the correct costume image (cute, cool, clever and cosmic), having the correct costume image multiplies the omoide score by 3. These events appear at A rank. If you have 5, 6 or 7 omoide appeals, including costume bonus, the last omoide appeal will be in the burst bonus section, if you didn't screw up your burst by getting a normal before it. If you have 8 omoide appeals, the last 2 omoide appeals will be in the burst bonus section. The score of these appeals is doubled as for any other appeal. The main difference in scoring potential between songs and difficulties comes from the chain bonus, the more notes a song has, the more chain bonus points you can get. There are accessories which increase the chain bonus. Not counting DL live rewards there are 50 and 100 point variants, and they are all on the leg slot on which they compete with drive trio (trio omoide appeals) which is also only available on the leg slot, so you can't have both at once. The DL lives changed this though. The 4th event of the ちょっぴり大人な気分 DL live rewards you with a leg slot accessory with chain bonus 150, and the first (or maybe the second) event of the いつまでもｋのままで DL live gves you an accessory with 100 chain bonus on the arm slot, and thus freeing up the leg slot for drive trio. In combination with the F rank tiara on the head slot you can still keep the charge level 2 which is usually on the arm slot to enable trio (and even quintet) bursts. Because of the chain bonus, the number of notes in a song is important. I think a topic where we discuss what to do to get a high score won't hurt. I'm not at a point yet where i can really contribute, but what are your findings? What are good skills or skill combinations for scoring? What should you focus on in lessons to boost your scores? Questions such as that. The only thing i can say is that the difference whether you use the correct costume type or not is huge. I tested it with the preorder (or maybe it was because of the limited edition) costume, which is C rank and much better than the other costumes i have. The preorder costume has much better stats and skills, but i scored way lower than when using the correct type of costume, in fact i even failed that live with the preorder costume. You can add people as friends through their Game ID. I think it makes sense to have a list of codes in a separate thread so we don't have to plow through the other thread to find them or to spam the other thread with codes. I'll post mine as soon as i have it. That can't be all, i know you are out there European Ps! Derived products, CD albums & anime / I'd like to go to an im@s concert, what should i do? Well, as the thread title says i'd like to visit an im@s concert, but i really have no idea where to start. First off, where can i find the dates for upcoming concerts? The wiki only lists the past ones. Then the next step is where to buy tickets. It seems they are sold at convenience stores in japan, at least sometimes. But i have no idea how far in advance and at which stores. Where can i find the corresponding information? I don't care if it's in Japanese, i should be able to work my way through, but i really have no idea where to start. Well, it isn't exactly community work, but i didn't know where to put it otherwise and it means a lot to me. On the background: After coming across the YouTube channel of David Ramos (aka Docjazz4) with him playing the ocarina and also teaching how to play it and all other things around it, i started playing it too. Anyway, about one and a half years ago David started a kickstarter campaign to release his first ocarina album. I pledged a few dollars, but a few hours before the deadline, he was missing about 1000$. The 500$ tier included a YouTube cover of a song of my choosing. I increased my pledge to that level, the album was funded (in the end he had about 1000 or 2000 more than needed) and i chose Yakusoku as a song. I have to admit i didn't play much in the past 2 or 3 years, mostly because my japanese studies took up so much time, but now i'm at a point where i can cut that back a bit and it want to pick up the ocarina again. I hope he can send me the sheet music for Yakusoku, it would be a fitting song to start again. Let's hope they make the right choice. And not a troll like the Shiny Festa release. Okayu made a detailed summary/translation of Chihaya's EX story Part 1 to 4 here. Because of this i really wanted to understand Yukiho's EX story in detail as well. I got the general idea when i was playing through it, but now i wanted to get the details as well. So i started to translate it. Apart from knowing the whole story, i will also be a good exercise for my Japanese I'll ask my Japanese teacher about all the parts i don't understand or i'm not sure of. But since i only have lessons once a week and they only last an hour, the progress won't be very fast. I expected to do 1 part per week, but i had my first lesson today since i started this project and clearing up the points i don't understand takes more time than i thought, since i'm also getting a crash course on the grammar or speech patterns used. It's my first attempt at something like this and i'll stay close to the Japanese wording, which isn't what a good translation should do, but it's easier for me :p But this will lead to quite a bunch of unnatural sounding English sentences i would never write like this when i'd write it myself from scratch (not to mention that English isn't my native language either). In that regard i'd like to make a disclaimer: I have trouble translating a lot of the Japanese expressions, expressions which don't have a real counterpart in English. A good example for this is "itadakimasu", even though it doesn't appear in Yukiho's story. I'm sure you have heard it a hundred times, and seen at least half as many translations, since there is no counterpart in English (although there is one in probably every other language in this world). I'll also add the transcript of the story. I made it using this video, thanks a lot to Byuusan for uploading it (i guess Byuusama on youtube is Byuusan here ). Because of this i'll also stick to the commu choices he made in this video. In the other thread the idea of an english wiki popped up several times. Has someone already started it? If so, what is the address and what does one need to do to help? I think there are many people here in the forum willing to help out and we could use this thread to coordinate our efforts. I'd help, if i ever get my game. Mostly by adding my own findings/experience but i can also add stuff i need to look up on the japanese wiki (i'm not really up for a full on scale translation though). THE iDOLM@STER ONE FOR ALL / Own (sub)forum for One For All? I think a new forum for All For One would be a good idea as the game seems to be quite complex. I guess we'll have a lot to talk about, especially since we'll need to figure out a lot of the systems and how to use them to our advantage. Is there an official off vocal/karaoke version of Yakusoku? Preferably the allst@rs (anime) version of the song. After discussing it with him i chose Yakusoku, it's a great song and it nicely fits within the range of a 12 hole ocarina (which is the kind i play myself). And that's the reason why i'm looking for an off vocal/karaoke version, as a backing track he can use. And i guess if there was an official one, that would be the best available quality. The demo will be up next week and the full game in august, so it's pretty soon. Let's hope it sells well, maybe that will help preparing the stage for future im@s games. Is it just me or is Shiny Festa relatively easy to understand? I still consider my japanese as beginner level. I'm around lesson 20 in the first みんあの日本語 book (of 25 lessons in that book) and i can read around 420 kanji (after using wanikani.com for about 4 months). So i recently picked up the Shiny Festa games again (Groovy Tune and Honey Sound) to check how much i understand now. And i'm amazed that i understood about 80% of what's going on in the SOF mode story parts. I can follow the story general story and most of the other stuff they are talking about, but there are some lines where i hardly have an idea what's going on. But compared to when the games came out, i understand a lot more. And i think Honey Sound is easier to understand than Groovy Tune. So i just wonder, are the Shiny Festa games really that easy on the language side? How about Im@s 2? Due to other games on the list (like Ni no Kuni) i didn't have the opportunity/time to go for another im@s 2 playthrough, especially when i want to read the promotions, story parts and stuff. What are your experiences? How about other games from the franchise? Page created in 0.18 seconds with 20 queries.